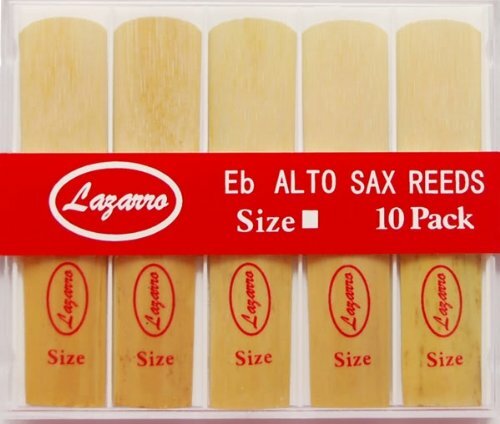 Lazarro 85-2 Alto Saxophone Reeds Size Strength 2, Box of 10 by Lazarro at Bass Brass. MPN: 85-2. Hurry! Limited time offer. Offer valid only while supplies last. Lazarro Reeds are perfect for Students, Intermediates and Professional Players. It made from High Quality Bamboo and has Worldwide Standards. Lazarro Reeds are perfect for Students, Intermediates and Professional Players. It made from High Quality Bamboo and has Worldwide Standards. Approved by Customers, Teachers and Musicians. Great Quality and Professional Sound Guaranteed. Try once and You will come back again and again. If you have any questions about this product by Lazarro, contact us by completing and submitting the form below. If you are looking for a specif part number, please include it with your message.